Drying cylinder is designed for drying bulk materials with furnace gases. 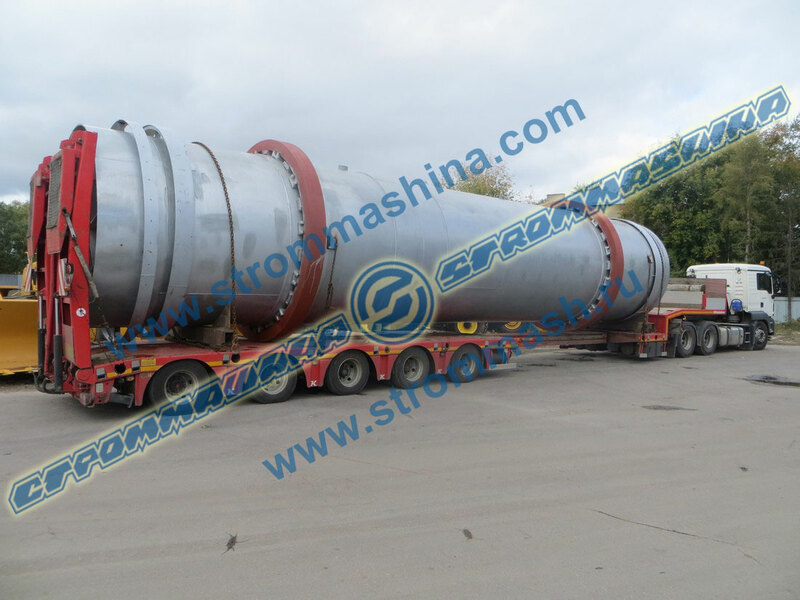 Drying cylinders are used in construction materials industries in various processing lines for heat drying of lime-stone, clay, sand, chalk-stone, gypsum and other bulky materials with particles lump size up to 60 mm. Drying cylinder consists of a casing, support and thrust station, support station, drive, tyres, toothed gear. - at the very beginning - screw type, in the middle drum part - lifting blade and sector type. Application of various head types depends on the properties of the drying material (input and output moisture, fraction composition, flowability, etc.) and is chosen in each separate case together with the customer and manufacturer. Casing support is represented by two steel tyres. One tyre is beveled for thrust rollers that prevent from the longitude drum shift. The casing is supported by its tyres on the support and thrust -support stations. Ring gear is fixed on the drum casing by means of cross-beams, through which the drum is rotating from the drive. The drive consists of drive pinion, gear box and electric motor connected between each other by couplings and mounted on one frame. The drum is installed towards the horizon at an angle 1o-4o. Casing incline in combination with axial rotation provides the material shift towards the discharge chamber. Hot furnace gases enter the casing and touching the material heat it up evaporating the moisture it contains. Heat transmission occurs by three main methods: in weighed condition at material falling from blades, from furnace gases through outer surface of the lying material in the material pile from more heated parts of the drum inner device and sidewall. Drying modes for various materials are changing depending on raw material moisture on the drum input and the required moisture of finished material on the drum output, material fraction composition subject to drying, material characteristics. Temperature of the heatcarrier supplied to the drum shall not exceed 900oС. Flue-gas temperature at drum outlet not less than 100 – 150oС to exclude possibility of moisture condensation in the drum discharge section. On furnace gas inlet of the drum there shall be vacuum not les than 30 Pa.
Fuel – natural gas, condensed gas, diesel fuel. * depending on head types. Capacity is not indicated since it depends on material characteristics, its moisture (initial and final), initial material size. To be determined by calculation method. As agreed with the customer it is possible to change drum casing sizes. As agreed with the customer an additional completeness by loading and unloading chambers is possible, heat generators, burners.